In his quest to end the world, a prideful researcher poured his fast knowledge into this opus. The bottomless abyss glimpsed in the blade's mirror finish imparts to its wielder eternal conviction which defies all creation. Apocalyptic Pain Massive Dark damage to a foe. Additional effect based on the pendulum. Guiding Revelation A symbol of apocalyptic corruption. Empowered by a chosen pendulum. 300% Bonus Elemental damage to a foe (Damage cap: ~630,000). On the next turn, it'll have 2 turns remaining. to all allies. Strength: 10% to all allies. Guiding Gospel A symbol of evolution's holy outcome. Empowered by a chosen pendulum. Restore all allies' HP (Healing cap: 1500). 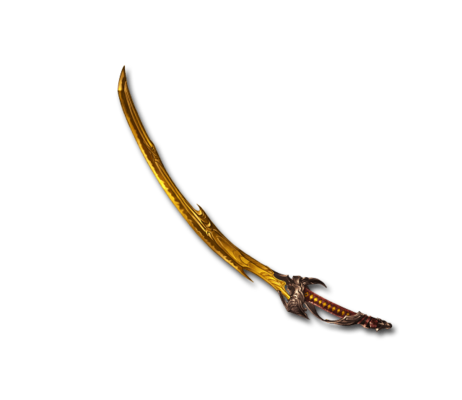 This weapon can not be reduced. Power-up items such as Gold Brick and Damascus Ingot cannot be used to uncap this weapon to 4★ or 5★. This page was last modified on 14 April 2019, at 20:57.